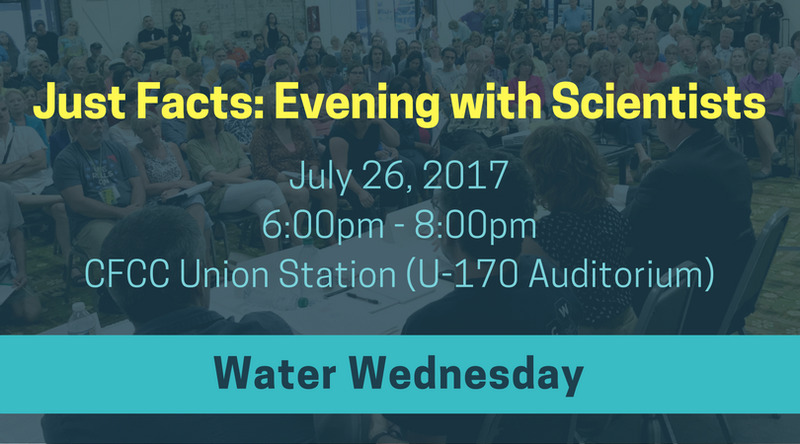 Our third Water Wednesday focused on bringing together North Carolina's leading scientists to discuss the facts surrounding the level of toxicity of GenX and what, if anything, we know about the other toxins in our finished tap water. Through Dr. Detelf Knappe's research on filtration methods, we learned that under-the-sink reverse osmosis (RO) filters did the best job of removing GenX and other PFASs in our finished tap water. Granular Active Carbon (GAC) did not seem effective at all in removing any of the PFAS. Below are slides from Dr. Knappe's research showing how five different under-the-sink filtration methods performed at removing all these PFASs in our tap water. Note: The top graph shows GenX and those chemicals that have KNOWN analytical testing standards. 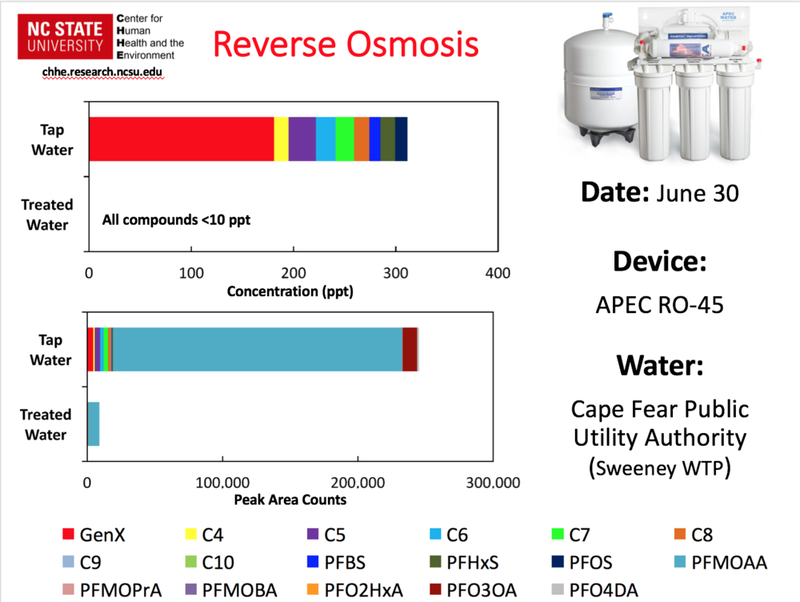 The bottom graph shows ALL the PFASs found in our tap water--including C3 (PFMOAA). Notice the tiny red bar in the bottom graph, that is GenX. This should put into perspective why it is extremely important we focus on more than just GenX, we need to focus on every PFASs in our tap water. Dr. Knappe stated under sink RO filters are adequate enough to filter out the PFAS--assuming you are fortunate enough to afford this alternative water treatment option. Whole house RO filters are costly and not necessary since these filters treat the entire house including showers, toilets, etc.--all high volume usage areas that currently pose little health effects. Dr. Knappe reminded us that only 1% of household water use if for drinking and cooking. Additionally, whole house RO filters waste a lot of water. The filtration ratio for reverse osmosis is 5:1, meaning for every five gallons of water you filter, only one gallon can be used. That's a lot of wastewater and one super expensive water bill--think five times more expensive than normal. Dr. Knappe cautioned us to focus on PFMOAA, also known as C3. Little is known about C3, yet it was detected at levels 50 - 100 times GREATER than GenX. There are zero analytical standards for C3--which means, even less is known about their health effects on humans. It is for this reason, Dr. Knappe cautions drinking the tap water--even at the new DHHS 'health goal' of 140 ppt. Dr. DeWitt discussed preliminary research on health effects of GenX (C6) compared to C8 (PFOA). These initial studies show GenX is less toxic than C8. However, Dr. DeWitt cautioned there are still many unknowns at the moment. For example, we know nothing about the health effects of C3--found at 50 - 100 times higher levels than GenX in our tap water. Or, how this "cocktail of compounds", as Dr. Cahoon calls them, reacts with each other and impacts our health. Ultimately, Dr. DeWitt said she would still drink the water so long as the GenX levels continued to hover around 140 ppts. However, she clarified her decision is based on her personal health, and the fact she has no future plans of getting pregnant. She also explained the current DHHS "health goal" of 140 ppt is not based on concentrations found in existing water. Health advisories usually pull their information from animal studies not the environment. To find out your personal exposure level you'd need to figure out your Margin of Exposure. This is the difference between the current DHHS limit of 140 ppt and what you were actually exposed to over the years. Ultimately, if you were exposed to very high levels of GenX over long periods of time, then your risk level increases. The tricky part is, not everyone who gets exposed to high levels of GenX will experience adverse health outcomes. Below are Dr. DeWitt's slides from her presentation. Dr. Knappe is a Professor of Civil, Construction, and Environmental Engineering at NC State University. He received his BS, MS, and PhD degrees from the Department of Civil and Environmental Engineering at the University of Illinois at Urbana-Champaign, and he joined the NC State faculty in 1996. Dr. Knappe is interested in drinking water quality and treatment, water reuse, organic micropollutants, development of water treatment processes for polar and persistent organic pollutants, and the fate of organic pollutants in solid waste landfills. He is a member of the Drinking Water Committee of US EPA’s Science Advisory Board, a Trustee of the American Water Works Association’s (AWWA’s) Water Science and Research Division, a Topical Editor for the Open Access Journal Drinking Water Engineering and Science, and a member of the AWWA’s Organic Contaminants Research Committee and the Standards Committee for Activated Carbon. Detlef Knappe and his students have been the recipients of numerous best paper, best poster, and best thesis awards. He is a recipient of the NCSU Outstanding Teacher Award, the Bill Horn Kimley-Horn Faculty Award for excellence in graduate and undergraduate teaching and other accomplishments at NC State University, and the Young Civil Engineer Achievement Award from the University of Illinois. Dr. DeWitt is an associate professor of Pharmacology and Toxicology at East Carolina University. She has a Bachelor of Science degree in Biology & Environmental Science from Michigan State University. She received her Ph.D. in Environmental Science & Neural Science from Indiana University-Bloomington. She was a Postdoctoral Research Associate in Environmental Toxicology, Indiana University-Bloomington and Postdoctoral Trainee in Immunotoxicology, UNC-CH in cooperation with the National Health & Environmental Effects Research Laboratory at the U.S. EPA. Dr. Smart is a William Neal Rynolds Distinguished Professor at NC State University. He completed his postdoctoral at Roche Institute of Molecular Biology PhD, University of Michigan. He is currently the Director of the Center for Human Health and the Environment. Dr. Hoppin is an associate professor in the department of Biological Sciences at NC State University. She received her PhD from Harvard School of Public Health in Environmental Health and Epidemiology, her masters from Harvard School of Public Health in Environmental Health and Epidemiology, and her bachelor's degree in Environmental Toxicology from University of California, Davis.